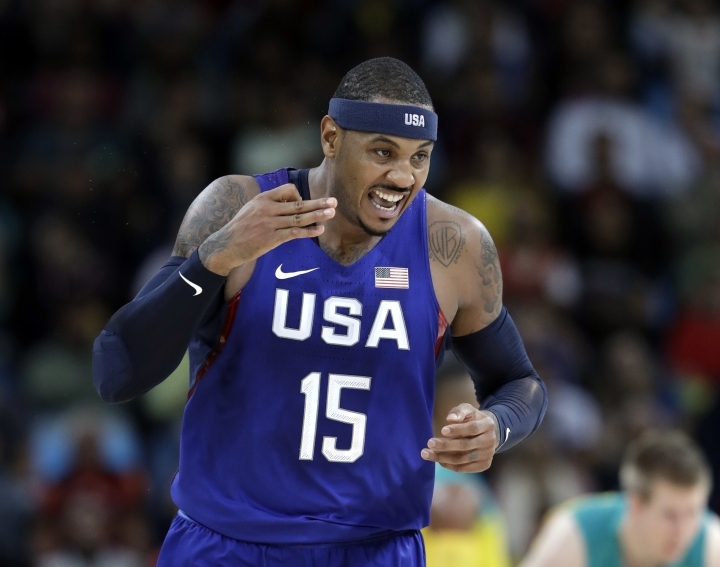 RIO DE JANEIRO — Carmelo Anthony took aim and shot to the top of U.S. basketball history. Anthony scored 31 points — and the Americans needed every one of them — as the overwhelming gold-medal favorites in the Rio Games outlasted Australia 98-88 on Wednesday night. The first American male basketball player to appear in four Olympics, Anthony also passed LeBron James as the most prolific scorer to ever wear a USA jersey. Anthony opened the game by making three 3-pointers and then moved past James, his close friend, with another 3 from the left wing with 1:08 left in the first quarter. "Of course I was conscious of it," Anthony said of the scoring mark. "My teammates was making sure I was aware of the situation, but tonight was one of those nights where I wanted to let the game come to me and take the shots that was given to me, take the open shots and kind of play basketball. "And at the end of the day I was in my zone, I was playing basketball." 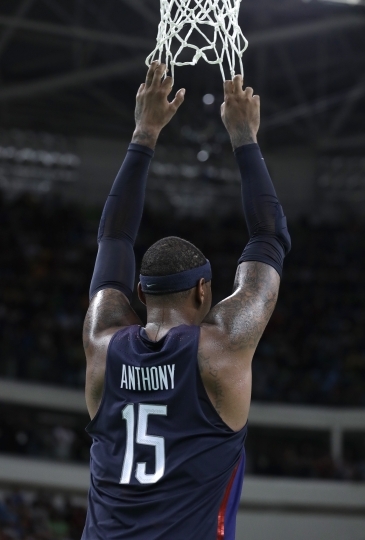 Anthony knocked down nine 3-pointers — one shy of his U.S. record — and finished 11 of 21 from the field. He added eight rebounds, two steals and may have saved the Americans from a loss by scoring 14 points in the fourth quarter. 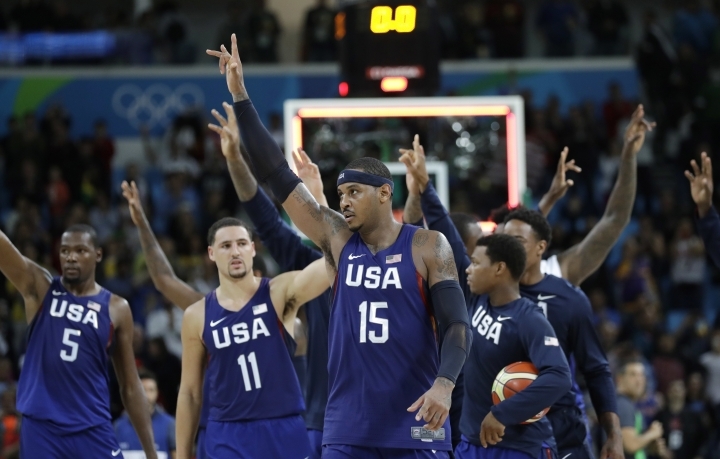 "Carmelo was magnificent," said U.S. coach Mike Krzyzewski. Anthony has scored 293 points in Olympic competition, 20 more than James, who skipped a chance to play in his fourth games after leading the Cleveland Cavaliers to an NBA title this season. David Robinson (270) is third on the scoring list followed by Michael Jordan (256) and Charles Barkley (231). For comparison's sake, Brazilian legend Oscar Schmidt scored 1,093 points during his Olympic career, but unlike Anthony, he didn't have his minutes restricted while playing on powerhouse teams. Anthony was delayed in attending his postgame news conference, and when he arrived wearing a white USA baseball cap adorned with the five Olympic rings, Krzyzewski congratulated the New York Knicks star on his accomplishment. "We have had great, great players and great teams play for the United States," Krzyzewski said. "His commitment to USA Basketball and international basketball, he's one of the best players in the world, but over this last decade he has proved to be one of the best international players." Although James and some other NBA stars passed on a chance to play in Brazil, Anthony signed up again and is making the most of what will undoubtedly be his final games. "He was wanting that moment," teammate Paul George said after the Americans escaped an upset. "He was special tonight. We joke about it, this being his farewell tour." Anthony's Olympic odyssey began with a disappointing performance in Athens, where the Americans staggered to a bronze medal and worldwide embarrassment. But he's been a major part of the U.S. program's resurgence. "His leadership has really blossomed big time," said Jerry Colangelo, USA Basketball's director. "I would say if Carmelo played on any team long enough he would be the leading scorer, that's the kind of scorer that he is."